fit together to form a whole. E.g. matching English to French, opposites, questions and answers etc would not really work well with Jumbled Words. So when is it appropriate to use Jumbled Words in Text Match? A note of caution is required here, however, as it isn't simply a matter of typing in any old half sentences. If you want all of the exercises on the start page below to work properly, you need to make sure that all of the matches are exclusive, i.e. that there is only one correct match for each left item. If you look again at the Drag and Match screen above, you'll see that there is only possible match on the right for each sentence starter on the left. 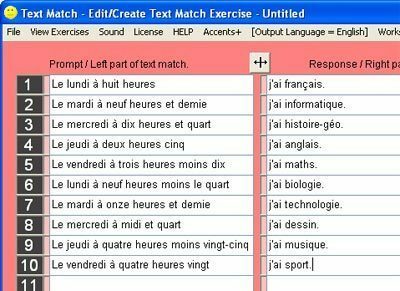 This is essential, because TaskMagic doesn't understand the text - it just checks to see whether the match the student has made matches with the information as you originally typed it into the edit screen. So all of the above exercises work because the matches are exclusive. You'll see that the Jumbled Words activity is available in the bottom row of exercises in the screenshot above. 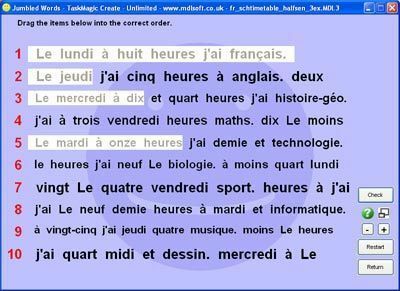 The trouble is, it can be quite difficult and time consuming coming up with 'half sentence' exercises where all of the matches are exclusive. What if you want to make some Jumbled Words activities but you don't want to have to agonize over your choice of sentences? The answer is to be selective! TaskMagic3 allows you to select which exercises are made available to the student when they open your file. If you look at the above list of matching sentence halves in the Text Match edit screen, you can see that any of the right matches could be logical and grammatically correct matches for any of the sentence starters on the left. 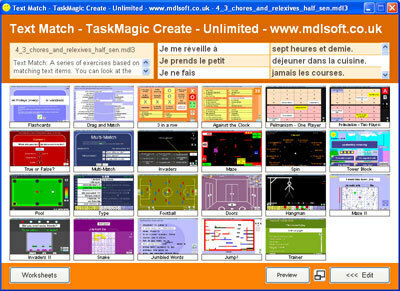 Because of this, many of the activities available in Text Match would not work properly. So... use the select / deselect check boxes to limit the available exercises to those which are appropriate for the content. On [day] at [time] I have [subject]. Click here to open the above Text Match file in TaskMagic3.